John Edwards, Marion Crain, and Arne L. Kalleberg (editors). 2007. 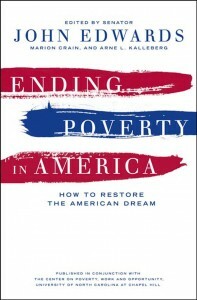 Ending Poverty in America: How to Restore the American Dream. New York: New Press. ISBN: 978-1-59558-176-1 (cloth). Is poverty a fact of life? Can the United States, the wealthie st nation in the world, do nothing to combat the rising numbers of Americans living in poverty—37 million according to government statistics—or the 50 million Americans living in “near poverty”? The editors of this book, who are affiliated with the University of North Carolina’s Center on Poverty, Work and Opportunity, and some of the country’s foremost thinkers say otherwise. poverty in America in the next thirty years. Thought-provoking, insightful, and full of forward-thinking ideas, this book lays out a much-needed path toward ending poverty—a template for a renewed public debate around one of the great moral issues of our time. Please find book reviews here.